Although a range of program and policy responses to youth gangs exist, most are largely based on suppression, implemented by the police or other criminal justice agencies. Less attention and fewer resources have been directed to prevention and intervention strategies that draw on the participation of community organizations, schools, and social service agencies in the neighborhoods in which gangs operate. Also underemphasized is the importance of integrating such approaches at the local level. In this volume, leading researchers discuss effective intervention among youth gangs, focusing on the ideas behind, approaches to, and evidence about the effectiveness of community-based, youth gang interventions. Treating community as a crucial unit of analysis and action, these essays reorient our understanding of gangs and the measures undertaken to defeat them. They emphasize the importance of community, both as a context that shapes opportunity and as a resource that promotes positive youth engagement. 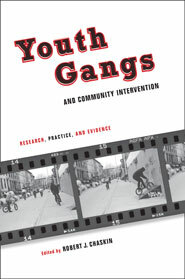 Covering key themes and debates, this book explores the role of social capital and collective efficacy in informing youth gang intervention and evaluation, the importance of focusing on youth development within the context of community opportunities and pressures, and the possibilities of better linking research, policy, and practice when responding to youth gangs, among other critical issues. The volume is divided into three parts; with the first section outlining historical contexts of the youth gang problem, delinquency programs, and gang policy. The volume then zeroes in on individual programs and the wider body of evidence regarding gang intervention and program effectiveness, specifically as related to gang prevention, intervention, and suppression programs. The third part of the volume focuses on the idea of community “as a unit of action to be mobilized,” while reassessing contexts and approaches. This book was created in honor of Irving A. Spergel, a social worker and leading scholar of gangs and community interventions and the George Herbert Jones Professor Emeritus at the University of Chicago’s School of Social Service Administration. The book is based on papers presented at Spergel’s Festschrift at the University upon his retirement. Spergel wrote the concluding chapter of this book. Robert J. Chaskin is an associate professor at The University of Chicago School of Social Service Administration and a research fellow at Chapin Hall. A sociologist by training, his research focuses primarily on community organization and the role of community and community-based efforts to improve the lives of children, youth, and families. He is the coauthor of Building Community Capacity. Youth Gangs and Community Intervention: Research, Practice, and Evidence is available through Columbia University Press.